Stone Lagoon is located on Hwy 101 between Trinidad and Orick. It has great birding with a mix of riparian hardwood, open freshwater, strong conifer influence and the open beach. The trip will also check out Dry and Big Lagoons along this exquisite drive. If you have a spotting scope, this is a great opportunity to use it. Ring-necked Ducks often hunker down in the reed beds, forest passerines will include Chestnut-backed Chickadees and Pacific Slope Flycatchers, and Varied and Swainson’s Thrush will serenade. There is a great chance to witness the magnificent Elk herd along this stretch. Expect mostly flat terrain, possibly wet ground. This trip will not stop for food. Restrooms are available at some stops. 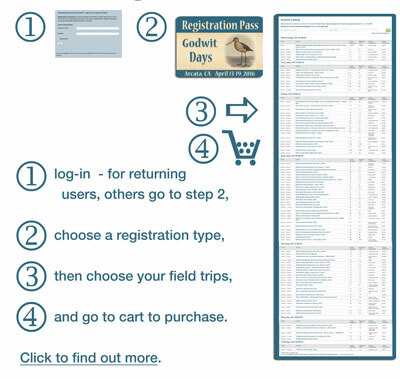 California State Parks is a major sponsor of Godwit Days and provides a variety of trips, access to the parks, and their expert staff as guides.